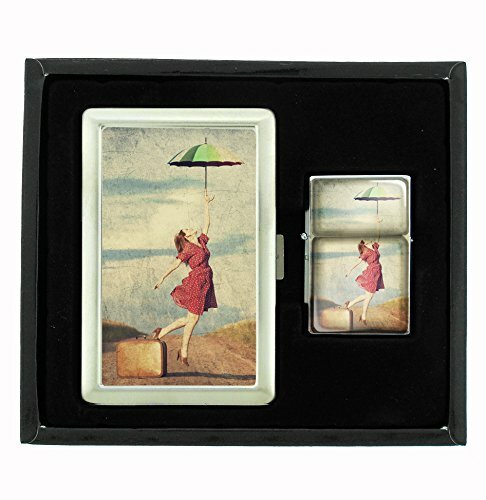 Umbrella Girl Vintage Traveler Cigarette Case and Flip Top Oil Lighter Set by Customized Collectables at Kerinci. Hurry! Limited time offer. Offer valid only while supplies last. SIZE OF THE OIL LIGHTER IS: 2.25'' x 1.5''. (Lighter fluid is not included) Please check out some YouTube Videos on how to use a flip top oil lighter. If you have any questions about this product by Customized Collectables, contact us by completing and submitting the form below. If you are looking for a specif part number, please include it with your message.